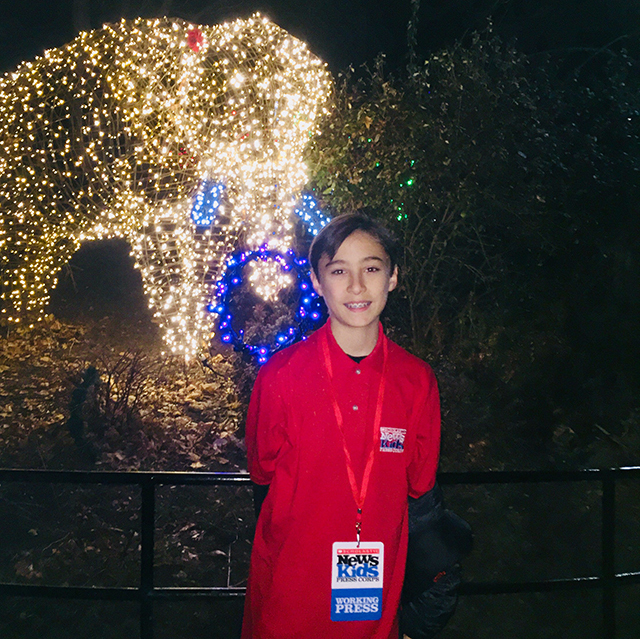 A Sparkling Night at the Zoo | Kid Reporters' Notebook | Scholastic Inc.
Daniel visits the Smithsonian’s National Zoo during “ZooLights,” an annual featival of lights and music. Visitors to the Smithsonian’s National Zoo in Washington, D.C., are in for a special treat this holiday season. Through January 1, the conservation center is home to “ZooLights,” an annual festival featuring lights, live music, and other entertainment. Animals, of course, are a big part of the celebration. Thousands of LED lights glow throughout the zoo, turning the trees and walkways into a winter wonderland. The sparkling displays take the form of birds flying through trees, raindrops falling, and lions, lizards, and other animals. There is even a play area with glow-in-the-dark games and activities for kids. A trackless “train” allows visitors to tour the Great Cats exhibit, which is home to lions, tigers, and other fierce creatures. Additional ZooLights attractions include snowless tubing and a ride on a carousel made with animal figurines. The zoo, which is one of the oldest in the United States, is dedicated to conserving animal species and their habitats. ZooLights, an annual festival of lights at the National Zoo in Washington, D.C., runs through January 1.